Summary: However murderous your thoughts, intentions or even actions have been there is hope for your future because Jesus is willing to take the rap for your crime. We live in an age where we can pick up any newspaper, or watch any news broadcast and be guaranteed to hear about another persons untimely death. This commandment in Ex 20:13 is as relevant today as it was when God first gave it to Moses on Mount Sinai. I. WHY IS MURDER WRONG? a. Because murder touches the image and likeness of God. Murder is wrong because it is not only a physical issue, but a spiritual one also. You see, to break this commandment is not only a direct act of violence against humanity, but more seriously it is a direct attack against the image and likeness of God in which the human race is created (Gen 1:26-27; 9:6). That is why it is very important for us to translate this verse carefully. Some older versions of the bible use the phrase, “You shall not kill.” But this is not what is said. The verse very clearly refers to murder - the taking of human life. 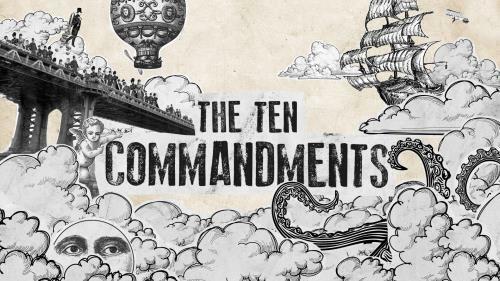 Many people operate on the principle that, “this is a living thing (plant or animal) and we must reverence life and therefore we must not destroy it.” The sixth commandment cannot be used to support this belief. It is only concerned with the sacredness of human life and in no way speaks to the issue of the life of plants or animals. It also is quite obvious from scripture that this commandment does not concern plants and animals. In the O/T we see that God is most certainly not a vegetarian, nor that he intended people to be. And its clear from the N/T that Jesus would sacrifice the lives of hundreds of pigs for the sake of ones mans sanity. So it’s apparent that the lives of plants and animals are not at issue here. Recently I saw a documentary on the ABC which highlighted the anti-population sentiment of many prominent environmental organizations - Greenpeace is one you are probably familiar with. Their argument is that the world is vastly over-populated by humans to the detriment of other forms of life. They even go as far as to say that we need to take immediate action to cull the level of the human population on the earth. That the current level of human population on earth is not sustainable and that we ought to make every endeavor to reduce it at once. It’s a view which sheds a whole new light on the motivation of such organizations. Why are they so bent on destroying, or at least limiting the only part of creation made in the image and likeness of God? What kind of society is it that we live in when we have no hesitation in aborting a human fetus as a means of birth control or discussing the euthanasing of the elderly or terminally ill and yet we fight to save one tree! We cannot say that this commandment is not relevant today. It is relevant precisely because it tells us what is on God’s heart and mind concerning the way we value ourselves and ultimately the way we value him. b. Because murder s an act of finality which cannot be reversed. Humans are destined to die once, and after that to face judgment. c. Because murder is the most far reaching act of human against human. ….make a parapet around your roof so that you may not bring the guilt of bloodshed on your house if someone falls from the roof. In other words, if someone fell off your roof and died, the whole family wore the guilt (NB By the way this may look like an accidental death and not murder, but we will explore this a little further in just a moment). The point here is that murder is wrong because it has repercussions right throughout the whole of society. Not only is the murderer and the victim affected but so too are their family and friends - and the society at large. How has your level of well-being and safety, even in your own home, been effected by the knowledge that there are serial killers waiting to be brought to justice. Murder is wrong because effects the entire community. However murderous your thoughts, intentions or even actions have been there is hope for your future because Jesus is willing to take the rap for your crime.